Last week, I spoke with Jacki Hollywood Brown, former Unclutterer contributor. During that conversation, she brought a great app to my attention called RoomScan Pro by Locometric. “Being a military family,” Jacki told me, “we move a lot. Presently we’re on our tenth move in 25 years.” With each new move, the military allows them do a “house hunting trip” of about 5-7 days, during which they can choose a new home prior to their actual move. This preparation requires some careful calculation. The following is how it works. There is a maximum house size limitation that is based on number of family members. The calculation for the maximum house size only includes actual living space such as living room, kitchen, bedrooms, bedroom closets, and bathrooms. It does not include stairways, hallways, storage areas, utility rooms, or laundry rooms. Most of the time, rental agencies and real estate agents provide the square footage of the entire house. They may include room sizes (e.g. bedroom = 12′ x 11′). All this means that Jacki must quickly calculate the actual living space to determine if the house they are looking at meets the maximum limits. “In the past,” she told me, “we’ve carried a large measuring tape and measured each wall. We also used a laser measurer.” That’s a time-consuming practice. RoomScan Pro makes things easier. 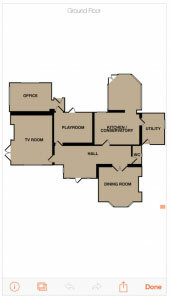 You can use it to draw the floor plan of one room in less than a minute. You can add windows and doors to your rooms too. In order to place the windows and doors in the correct places on the walls, you do need to measure the distance from one edge of the window/door to the edge of the wall. You can add another room beyond any doorway you create in order to do the plan of an entire house. The length of the walls can also be manually edited if you so choose, for example compensate for thick baseboard trim. Jacki notes that she and her husband were able to measure a 2000 square foot apartment in about an hour. The resulting plan will allow them to figure out what furniture will go where or whether or not it’s even worth it to move certain pieces of furniture from their current home. I highly recommend this app to realtors, professional organizers, interior designers, and decorators who need a fast and easy way to create a floor plan. There is also an in-app purchase option that allows you to download the floor plan in various formats, including those that can be imported to a CAD program. It’s just not for those who routinely move, but anyone who needs a reliable floor plan quickly and easily. If that’s you, check it out. The following is a sponsored post from Staples. As regular readers know, we don’t often do sponsored posts (our most recent before this series was in 2013). But we agreed to work with Staples again for two posts because they sell so many different organizing and productivity products in their stores and we like so many of the products they carry. Our arrangement with them allows us to review products we have extensively tested and have no hesitation recommending to our readers. And, these infrequent sponsored posts help us continue to provide quality content to our audience. For as much time as most people spend in their desk chairs, I’m always surprised when someone purchases an uncomfortable one. If you work a 40-hour week, 50 weeks a year, you’re looking at roughly 2,000 hours each year of use from this piece of furniture. That’s a lot of time to sit in something that isn’t super comfortable. I needed a new office chair for the home office, and opted to try the Staples® Sonada Bonded Leather Managers Chair in black. Some of you may not know this, but Staples offers a wide variety of office chairs under their own brand. The Staples Sonada Bonded Leather Managers Chair is $249, and at this value, looks (and feels) much more expensive than the price. And, after a number of weeks of use, I can say that I’m very happy with this choice. I’ll admit the most shallow thing first: I feel like a super villain when I’m doing work now. It’s as if I’m Ernst Stavro Blofeld, Dr. Evil, or Dr. Claw. My cat has so far refused to sit in my lap while I work, but one day it will happen and my imaginary alter-ego will be fully realized. More seriously: The chair is faux leather, which I actually prefer because it cleans really easily. I’ve spilled coffee on it twice already, and unlike my previous fabric covered chair, the coffee didn’t leave a stain or mark of any kind. The chair is also the epitome of comfort. It’s like going to work and sitting on a pillow. The company says it’s good for up to 10 hours a day of use, and I buy that. You shouldn’t be sitting for any longer than that anyway. You can adjust the lumbar, seat height, and tilt of the back (you can lean back and tap your fingers together when you’re thinking, if that is something you like to do). My son likes to sit in it and read, while spinning himself around in circles. Such a thing would make me dizzy, but he says it’s very smooth as it goes around and around. It’s also on casters, so you can scoot around your office if necessary. One thing you may want to consider with this chair: It only comes with fixed arms. I haven’t wanted to adjust the arms, but if that is something you really want then you might look at the chairs they have with adjustable arms, and Staples offers several options. Check out the Staples Bonley Mesh Chair (which comes in GREEN!!) if arm adjustability is your thing. Another thing you may want to consider if you are under 5’4″ — your feet might not touch the floor if you sit all the way back in the seat (it’s 23.9″ deep). My friend who isn’t a giant like me says this is standard, though, so you may not even notice. 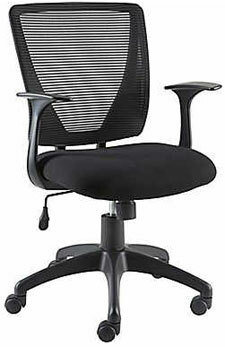 Staples Vexa Mesh Chair has a smaller seat depth, so give it a test drive instead. Conclusion: I really like the Sonada Bonded Leather Managers Chair. It is by far the most comfortable chair I’ve had at my desk and my repetitive stress injury isn’t acting up with its use, so I see no reason to use anything else. 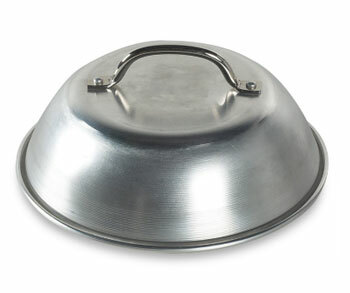 In case you’re confused by what the Cheese Melting Dome is, it’s an aluminum bowl with a handle on its bottom. (A handle, made of aluminum, that conducts heat and will easily burn the skin off your fingers if you decide to touch it. Because that’s what metals that conduct heat do when you place them on a heat source.) And this bowl-with-a-handle-on-it traps heat on your grill the exact same way closing the lid of your grill does. 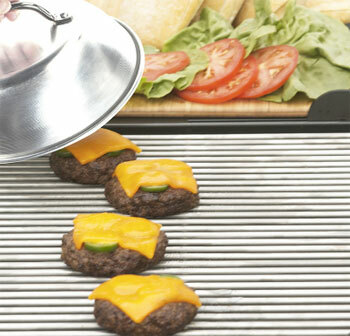 It also does the exact same thing a rounded pan lid would do if closing the lid on your grill was too much work. Or, you know, the heat of the burger when it’s freshly removed from the grill can also melt a slice of cheese on a bun but DETAILS. This gadget may not even have enough of a purpose to be a UNItasker and can be reproduced by so many other things that, again, I must praise its inventor for getting it to market. It’s so brilliantly unnecessary that I love it with a fiery passion. This may be the winner of all unitaskers. Thanks to reader S for bringing this gem to our attention. It is glorious. Goodreads is the internet’s largest site for book discovery. Countless book lovers use it every day to find titles to read, talk with each other, post reviews, and interact with some of the authors they admire. That’s fun, but there’s so much more you can do with an Goodreads account. The following are suggestions for how to get the most of Goodreads. To visit your stats page, log in to your Goodreads account, then click My Books at the top of the page, and then Stats on the right. Here you’ll see all of the books that you’ve told Goodreads that you’ve read, sorted by year. Click Pages to see the total number of pages you read in a given year, and hit Publication Year to see how often you read books published within a given year. Additionally, click Details next to each collection to see the specific titles you read as well as their ratings. Lastly, I like to click View Books From [year] for a list of those titles, and sort the result by rating, author and more to try and spot trends. Did I enjoy a certain author’s work? Was there a genre I went to more often than others? It’s a fun and very organized way to take a good look at your reading habits. The practice of “showrooming” — visiting a brick-and-mortar store to do research before making an online purchase — is real. The Goodreads mobile apps for Android and iOS includes a barcode scanner that’s much more versatile. Instead of making a purchase, you can use the app to quickly find reviews of a book you might buy right then and there. I’ve done that several times. If you do buy the book, you can add it to your “shelf” to share what you’re reading. Each year, Goodreads challenges users to read a certain number of books. It can be fun, and the 2016 challenge is underway. Once you’ve joined, your followers and friends can note your progress and cheer you on. Of course, this isn’t for people who don’t want to make reading a competition, but others can enjoy it. Goodreads lets you sort books into categories, or “shelves.” By default, you start with three: Want to Read, Currently Reading, and Read. You can create as many custom shelves as you want for additional organization. To create a shelf, click My Books at the top of the page and then Add Shelf on the left. The rest is up to you: “vacation favorites,” “guilty pleasures,” “business and work,” “borrowed from friends” and so on. With a click you can see only the books that are on any shelf. 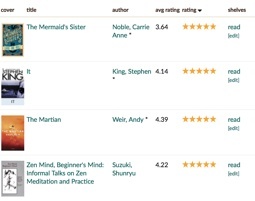 Goodreads also will recommend books you might like based on your habits. You can improve its accuracy by liking and rating lots of books. Also, note the books you don’t like and lastly, keep sorting books into your custom shelves. You’ll notice your recommendations improve over time. With a little time and organization, you can turn Goodreads into a very valuable organizing service. Spend an hour or so with these tricks and you’ll have a much more satisfying experience. Today we welcome guest post author Ryan McRae, who is the founder of the website TheADHDnerd (a blog dedicated to helping people with ADHD be more productive). If you’re interested in learning more, he has a free book for download, Conquering Your Calendar and Getting More Done. I’ve had ADHD all of my life and I never had the natural ability to organize; I distinctly remember my third grade teacher dumping my desk out when I couldn’t find something. I remember misplacing my wallet constantly and having clutter surrounding me most of my days. The amount of time I have wasted letting my ADHD run my organizational life could have earned me a Ph.D.
No more. The following are the strategies I use to get my ADHD to cooperate with my need to have my life in order. If you are looking to clean your house, your ADHD mind will quickly attempt to deter you from this enormous project. You have to break it down into manageable pieces and if your ADHD still pressures you to catch up on your Netflix queue, break it down into smaller bits and pieces. One task I absolutely detest doing is laundry. The entire spectrum of the task from loading the washer to putting away the folded t-shirts puts me into a fit. So what I do is put on a movie I’ve seen before or a podcast and listen to it while I do this abhorrent task. If there is ever a Kickstarter project that eliminates this task, I’ll put a lot of money behind it. When I used to get home from work, I’d change out of my work clothes, flop down on the couch, and think about what dinner was going to be. Many times I didn’t get up from the couch. I noticed that the next day I couldn’t remember what I did with my keys and where my shoes were. My mornings didn’t start off great and left me no time for coffee. And who has two thumbs and loves coffee? This guy. So I had to develop a routine that I would launch into as soon as I went home so I knew where my stuff was as well as leave me room for my beloved nectar, my best friend, coffee. Grab the mail and go through it and only take in the house what I need to process. Throw out the rest. Empty my pockets in the container by my front door immediately. Change out of work shirt and evaluate if it can be worn again: hamper or hang it. I do this every time. This way I know where everything goes and I don’t have to sweat getting my evening going. I’ve built a great morning routine and before-bed routine as well. This minimizes my stress and headaches searching and wondering what I’m doing next. I stole this idea from Chris Bailey in The Productivity Project. Having one day, a maintenance day, to do all of your low energy tasks is much wiser than alternating between something that takes a lot of time (cleaning out the garage) and then trying to do something simple (dusting the living room). Batch all of your simple tasks together. He calls these “low-return” tasks. Instead of doing them throughout the week, depleting some willpower throughout the week, just knock them out all in one day. Since my Thursday is my maintenance day, I will get up early, and attempt to get all these little tasks done before 1:00 p.m. It’s my own personal competition — this way they are cleared out for the week and I can set my mind on other larger projects. ADHD can trick me into being collectors of all kinds of things. My weakness is t-shirts. My t-shirt collection grows due to sales and convention swag every year. I can’t get enough t-shirts. It becomes a storage issue quite quickly. So I have my own personal Hunger Games when it comes to my t-shirts. Once I can’t fit the folded shirts in the drawer, it’s elimination time. I use my ADHD to quickly assess which t-shirts will remain and which will be donated to the local thrift store. I simply sort them and if they don’t grab my attention, they must go. If I try it on and it’s a bit of a stretch, it is soon eliminated. Paperwork can grow like this overwhelming kudzu, filling the desk and creeping into every bare surface in the house. When it comes to paperwork, there are only three choices. Paperwork I know that I need in a moment’s notice, I’ll scan using my smartphone. I save everything on Evernote and make sure it’s secure. Examples of what I scan are: travel itineraries, passport information, and my car insurance card. When I need to store something larger, I have a file folder system — this is for manuals, workbooks, etc. Otherwise, I shred it and don’t look back. The Staybowlizer is a silicone dish that helps to hold a bowl in place when stirring something. You know, the same way your hand holds onto the side of the bowl when you don’t want it to move — but in silicone! Thanks to long-time reader Marte for sharing this unitasker suggestion with us. It’s Monday and the weather is turning nice here in the northern hemisphere, so I thought it would be fun to talk about an organizing project that isn’t super serious. Specifically, if you’re someone who enjoys spending time with friends over a good beer, this post is for you. With a little preparation you can have an entertaining, informative, and laid-back beer tasting at home. My love affair with beer started with the yellow American lagers we all know. After these traditional American beers, I ventured out to other styles. The beer that really caught my attention early on was a Bass Pale Ale. What an experience that was: sometimes beer is brown! And bitter! What else is out there? Today I enjoy porters and stouts, IPAs and bitters, Witbier, and Scotch ale. And that’s part of the fun of beer. It’s varied yet accessible. Casual yet complex. While wine can be intimidating, beer never is. That’s part of the fun of a beer tasting, and having an organized beer tasting is easy. Before you run out to your favorite store to buy beer, you must know your audience. Remember, the idea here is to introduce and try novel styles, but you don’t want to make that an unpleasant experience for your guests. If your guests typically enjoy the aforementioned traditional American lager, consider lighter styles for your tasting. A lager like Hoponius Union is a great choice. Likewise, you’ll do well with a golden ale like Ipswich Summer Ale or a Born Yesterday Pale Ale from Lagunitas. The idea is that these “crossover” beers, as they’re called, are similar to what your guests like so as not to be a total turn-off, yet different enough to be compelling and interesting. Remember, too, that you don’t want to overwhelm your guests with too many flavors. Four or five options should be all you need. Make sure there’s plenty of room in the refrigerator. Most beer likes to be upright and stored at about 45ºF, though there are exceptions. Unless you’re serving serious beer snobs, don’t worry too much about that. Just make sure the beer is cold by serving time. Glassware can be important, depending on how much you want to get into it. It’s believed that certain glassware can enhance the experience of drinking various styles of beer, by trapping aromas and such. If you want to go for it, go for it. You’ll add to the fun. Honestly, for most beers and the people drinking it, plain old pint glasses will do fine. If you can, avoid paper or plastic cups. I recommend starting with the beer with the lowest percentage of alcohol by volume and moving toward the highest. Additionally, put your hoppiest beers toward the end, as they’re typically strong in flavor and can affect your ability to enjoy more subtle and nuanced offerings earlier in the tasting. Lastly, have some food on hand. Bread and popcorn will help “cleanse the palate” between brews. Cheese goes well with beer, so a variety of cheeses might be a good idea, too. This may be obvious, but you are inviting people to travel to your home and drink alcohol. I recommend finding designated driver(s) and rewarding them with a gift of some sort. This way everyone is safe and the people who do the shuttling are rewarded for their part. A beer tasting can be a lot of fun and educational. Expand you horizons a bit and try something you typically wouldn’t. Learn about the styles of beer and where they’re from. Finally, understand that a “beer expert” is simply a beer drinker with an opinion. When you stay at a hotel, you’ll usually be provided with toiletries that are free for you to take along: shampoo, shower gel, hand lotion, etc. However, some people seem to feel compelled to take these at every hotel they visit, and they wind up with huge unused stashes at home. You didn’t open them, and there’s a charity you support that needs such things. And you’ll be able to drop off donations in the near future. You used them, and you really like them. You want to use the remainder and maybe order more — or just enjoy an extra bit of luxury. I rarely take hotel toiletries, but this happened to me on my last stay. You used them, and they were just okay, but there’s enough left that you hate to see the partially used bottles go to waste. You’ll take them home and use them yourself or you’ll give them away using Freecycle or some other organization that accepts open bottles. That last one can be problematic — will you really use those toiletries or pass them along? Or will they just sit in a cupboard for years? If you already have a collection of such bottles, it’s a good sign that perhaps you should just leave these new ones behind. While I don’t personally need to shine my shoes, I can still use that small shoeshine kit as a stocking stuffer or to add to a grown-up Easter basket. I don’t know anyone who would want to get a hotel’s shoeshine kit in a Christmas stocking — but if you do, and you have a place in your home to accumulate stocking stuffers, then taking the kit might make sense. It certainly fits within the list of consumables that hotels expect you to use or take. If you happen to take long-haul flights or fly in business or first class, you may get an amenity kit with toothpaste, a toothbrush, eyeshades, etc. If you get this on an outbound flight and don’t want to haul unwanted amenities around for the rest of your trip, you might decline to take the kit so things don’t go to waste. But if you want just some of the amenities, there’s often no great option — you either toss the things you don’t want or you let them clutter up your bags until you get home to donate the items you won’t use. If you do decide you want the hotel toiletries, remember to take time to ensure they won’t leak during the rest of your trip and cause a huge mess. It would be a shame to have a freebie ruin something like your luggage, your clothes, or your electronics. Spring is finally here (well, at least for those of us in the northern hemisphere) and it’s time to do some spring cleaning. Previously, we’ve discussed how to prepare, start, and focus your spring cleaning efforts on specific areas of your home, like the yard. Today, I’m looking at your smartphones and tablets because your electronic devices need to be cleaned, too. This topic deserves more attention than you might think. Given that tablets and smartphones are sensitive electronic devices — not to mention expensive — there is a right way and a wrong way to clean them. Additionally, keeping your devices looking great no only makes them more pleasant to use, but it usually enhances its resale value. The simplest bit of advice for keeping your smartphone and/or tablet clean: Keep your device in a case. You can buy a protective case for the most extreme conditions (think protection from water, dirt and falls), but if you’re simply interested in avoiding dirt, lint, and other day-to-day messes, a simple case will do. I use a plain leather case from Apple most days and it does its job well. Screen protectors are another option. These adhesive bits of transparent plastic are custom cut to fit perfectly over your phone’s screen, offering a layer of protection without sacrificing touchscreen features or sensitivity. Most peel off without leaving any residue as well. First, get a microfiber cloth. Unlike paper-based tissues, a microfiber cloth does not pose a risk of scratching your device’s casing or screen. They attract oils and dust for complete removal, versus your cotton t-shirt which just spreads stuff around. Microfiber cloths are readily available, and you might even get one for free if you ask your local optometrist nicely. Next, turn your device off or put the display to sleep. This is done to make it easier to see the grime. Wipe to clean one section and then move on to the next. Soon the whole device will look shiny and new. It’s important to keep the cloth clean as well, as repeated use will cause a built-up of the oils and dust that you remove. Just briefly soak it in warm, soapy water, rinse well and let it air dry. Don’t ever throw it in the dryer with a sheet of fabric softener. If you don’t have access to a microfiber cloth, just grab some scotch tape. It does wonders for lifting fingerprints and dust from a glass screen. Just press it on and then lift it off. Repeat until you’ve cleaned the whole screen. It’s a bit more wasteful than a cloth, but will work in a pinch. First and foremost, never spray cleaner or water directly on your device. Ever. Also, never use alcohol-based cleaners. These can damage or remove the protective coating that exists on the screens of many smartphones and tablets. Next, don’t spend too much money on those commercial cleaners. If you have a stubborn bit that the cloth can’t remove on its own, you may turn your device off and then dab a small portion of your cloth into water and then gently scrub at that bit on the screen or casing. Most times that will work just as well as the cleaners. Just don’t get the water near any openings (speaker, jack, etc.) and don’t dilute alcohol and water together. It’s been demonstrated that even a diluted alcohol solution can damage a device. Finally, paper towels, facial tissues, napkins and the like have a very high likelihood of scratching a screen. Avoid them entirely when it comes to cleaning your tablet or phone. There’s how to safely extend spring cleaning to your devices. With a little TLC they’ll work for a nice long time, until you’re ready to sell for a good price. The act of writing things down helps you remember details. Think of the notes you took in college or the shopping list you can “see” in you head. Today more and more people are producing digital notes, but research suggests that’s not the best method as far as recall is concerned. In 2014, the Association for Psychological Science conducted a study on note-taking and recall. A group of students were told to take notes on a lecture. Half of the subjects used a laptop while the others used pen and paper. While both groups memorized the same number of facts, the pen-and-paper group outperformed their counterparts in tests on the material. Why? It could be because writing is slower. A recent study by Scientific American suggests that, in a note-taking scenario, we can’t possibly write everything down verbatim. Instead, we must listen closely and record key words or concepts that represent what’s being said in a meaningful way. Conversely, speedy typing lets us “drone out” and record everything, as if simply taking dictation. Procrastination is a vile, seductive monster. While beneficial procrastination is possible, it’s the exception rather than the rule. Stop procrastinating and take time to do what must be done and simply do it. I start each day with my three MITs, or Most Important Tasks. When they’re complete, everything else I tackle that day is a bonus. I recently revealed here on Unclutterer that the tidy life doesn’t come easy for me. As such, I really dislike the idea of an entire Saturday spent cleaning. That’s why I’ve adopted the habit of tidying up along the way. It requires almost no additional effort and is immensely helpful. Walking upstairs? Grab that book that goes on the upstairs bookshelf. Going outside? Put the recycling on the curb. All of these tiny tasks add almost no time to what you’re already doing, are super simple, and have a huge impact on the state of things in your home and office. Big thanks to Leo at Zen Habits for inspiring this post. Three simple ideas — write it down, execute, and tidy up — can have a massive improvement on your surroundings and your day. If you make them a part of your routine, you’ll enjoy the results. Some of our most precious possessions are now in digital form. In many cases, email has replaced hand-written or typed letters. Digital photos have largely replaced those taken with film. And then there are the components of our on-line presence: websites, Facebook pages, etc. Your Digital Afterlife, by Evan Carroll and John Romano, explains how you can help ensure that these items get handled according to your wishes after your death. The book is copyright 2011, which might make you think it’s dated. But while specifics regarding websites may change, most of the book deals with issues and strategies, not the tools you might choose to use. And the legal status of digital executors and digital estate plans, largely undefined at the time the book was written, is still largely undefined — although some states have passed legislation about this. The first part of the book explains why planning for your digital afterlife is so important and why that can be challenging. For example, the authors wrote, “One of the many issues with preserving your digital content is that much of it does not reside on a computer over which you have direct control.” The service providers you rely on may go out of business or may have terms of service that restrict how others can access your account after your death. Do your heirs a favor and think ahead during your life and tend to your date. Curate and weed your collections. Consider tagging your favorites, deleting the duplicates, editing them, and tagging them. … You could certainly keep all of your photos, but be sure that your favorites are kept separately. The second half of the book deals with creating an inventory of your digital assets and a plan for sharing that inventory so your wishes can be honored. The inventory is critical because no one can do anything with assets they don’t know exists or that they can’t access. For example, would anyone know I have a subscription to the Associated Press Online Stylebook, that auto-renews, if I didn’t have it in an inventory? The inventory would include user names and passwords, along with your wishes for how each item should be handled. For example, do you want a social media or photo sharing account to be deleted? Do you want some photos within those accounts to be shared with others? While the authors show the inventory as a spreadsheet, I realized my item listing in 1Password can serve as my inventory. I would just need to add comments indicating what I’d like done with each item. Once you have the inventory, you need to determine how the right person gets access to that inventory after your death. If you totally trust the other person, as I trust my brother, you might send that person a copy of the inventory file — or make sure the person knows how to access your computer where the inventory is stored. Otherwise, there are digital estate services that can provide information to the appropriate person once they receive the necessary documentation, including a death certificate. 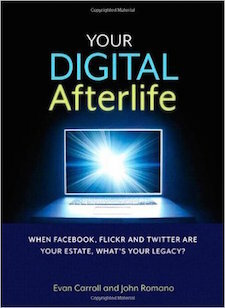 Your Digital Afterlife is a quick read. Some of the early chapters seemed to be stating the obvious, so I skimmed through them. The inventory forms seemed a bit too simple in some cases — for example, they had no place to enter the answers to the questions that some sites (such as my bank) ask before granting access to your account. But the general concepts are logical and well explained. It’s a good book for getting you started thinking about a complex and sensitive topic. Living an uncluttered life isn’t always about stuff. 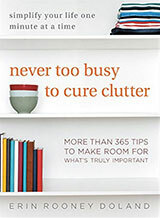 It’s also about clearing clutter from aspects of your life that keep you from doing what you would rather be doing. 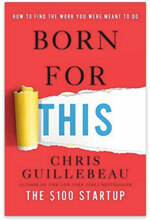 Chris’ book is perfect for anyone looking to unclutter a bad job or career from your life to do exactly what you should be doing. This isn’t a “dream big” book that leaves you inspired but without steps and tools to achieve what you want. 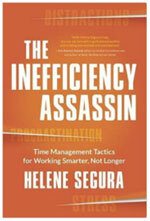 This book is full of every tool you will need to make your job and/or career change happen. If you’re a regular reader of this site, you know that I’m a bit of a fangirl when it comes to Chris. One of those reasons is because his advice is based on years of research and includes examples from actual people who have taken his advice and found success with it. If you’re unhappy or disgruntled with your work, his book is exactly what you’ll want to read to move productively in a new direction. 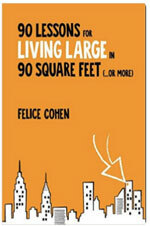 A few years ago, we wrote about Felice because she lived such a full life in such an itty-bitty NYC studio apartment. Since that time, she has sat down and written an entire book exploring her strategies for occupying such a tiny place. You don’t have to live in an extremely small space to benefit from the advice in her book, though. I found her text easy to read — it’s mostly lists that are direct and simple to follow. There are 90 “lessons” in the book to go with the 90 square feet theme. If you know any graduates heading to college or a big city with a tiny space, this book would be perfect for him or her. Asha has been writing the ParentHacks website for more than 10 years, and her latest book is a cultivation of all the best advice she’s seen during this time. 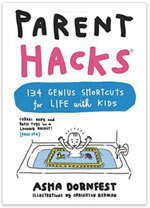 The book is illustrated and in full color and every page is packed with useful tips to make parenting easier. My favorite thing about this book is how often it transforms objects that on the surface seem to be unitaskers but shows you how they’re really multi-taskers. (16 uses for a baby wipe tub, 13 uses for non-slip shelf liner, 8 uses for a baby bath tub, etc.) If you’re a parent, you will want this book. If you have a friend or family member who is becoming a parent, they will want this book. This book is my new go-to gift for anyone who announces she’s pregnant or becoming a parent in another awesome way. There are so many real-world tips in this book that almost every page contains a piece of advice you can use to make life with kids easier. 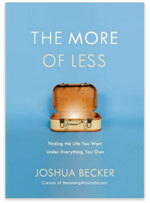 Today is the release of Joshua’s book and it’s perfect for anyone who is coming to uncluttering with the hope of having a more fulfilling life. His book explores the topic of simple living in a much more philosophical manner than what we usually delve into here on Unclutterer. And this minimalist philosophy speaks to a lot of people, so if that sounds like you, pick up this extremely resourceful and guiding text. The advice is solid and practical. 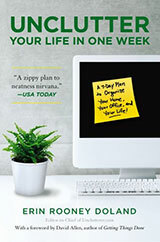 It’s not an organizing book — it’s a live with less stuff book. It’s a must-read for anyone looking for a step-by-step guide to minimalism.